Wanila was born at our stud in 1994, sired by the legendary Ansata Nile Pasha and out of one of our best foundation mares – Wanessa (by El Mokari out of Washa). 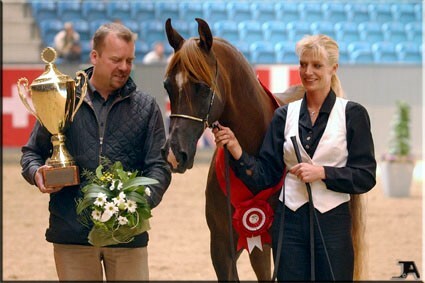 Wanila’s show career was long and successful with championship titles across Europe. She quickly became a well-known lady on the show circuit and gave us, as her breeders, great recognition around the world. She also proved to be one of those top show horses that can also pass on their best attributes to her offspring – especially with respect to her type and movement. Among others, her first son Wan-Kahli, born in 1999 by FS Bengali, is a multi champion in the show ring and now himself the sire of numerous champions. At the stud today we have three daughters of Wanila – two of them (Wakhida by Khidar and Walena by El Sid) are themselves broodmares, and her last foal Wantasia by Juwel OS was born in 2013. All three have been successful at the shows and we look forward to the coming generations. There is no doubt that Wanila has brought huge honour and pride to Husted Arabians over the past two decades.